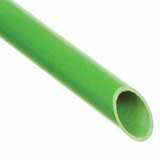 Jameson's 6' LS Landscaper Series Green Hollow Core Saw Section w/ Female Ferrule by Male Ferrule. Extension sections can be added to your head pole (either a saw section or pole pruner) to increase your reach to the desired height. The extension section are also used with Quick Change tools where the tool plugs into the female ferrule of the extension pole.Jamson's light duty pole for landscapers. 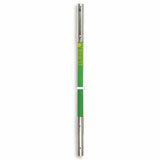 LS poles have a hollow core and thinner wall, resulting in a lighter, more flexible pole. Using the same ferrules, LS poles are interchangeable with the JE and FG poles.